GROUP OF TEN: Military Cross (GRI); 1914-15 Star; British War Medal 1914-18; Victory Medal 1914-19; 1939-45 Star; Africa Star, clasp - 8th Army; Pacific Star; Defence Medal 1939-45; War Medal 1939-45; Australia Service Medal 1939-45. LA (see note) VERGUIER Colin R.Colquhoun 18-9-18 on first medal, 3267 Pte C.R.Colquhoun 10/Bn. A.I.F. on second medal, Lieut C.R.Colquhoun. A.I.F. on third and fourth medals, SX2814 C.R.Colquhoun on fifth to tenth medals. First medal engraved, all other medals impressed. 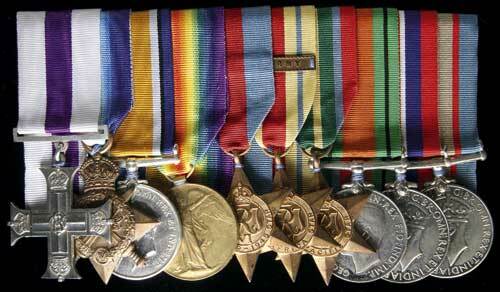 Swing mounted, contact marks on some medals, otherwise very fine - good very fine. Together with a swing mounted set of original miniatures for first four medals but ribbons damaged, the Military Cross engraved on reverse, 'La Verguier/Colin R. Colquhoun/18.9.18'; also a medal mounting bar with matching set of ribbons to the Group of Ten. Note: correct name of battle site where Lt Coloqhuon was awarded the MC is Le (not La) Verguier as is engraved on his MC. MC: LG 15/2/1919, p2383; CAG 17/6/1919, p1016, to Lt C.R.Colquhoun 4th Aust Machine Gun Bn. Citation: For conspicuous gallantry, energy, and initiative during the attack east of Le Vergieur, on 18th September, 1918. While in charge of a section detailed for barrage work to cover the advance to the second objective, he led his section with the attacking waves of the infantry, and when, near the first objective, they were held up by heavy fire from the enemy machine-gun nests, he placed his men in shelter and immediately organized a bombing party and led them forward. He shot one of the enemy's gunners and drove the rest along a trench into a party of our infantry. He then brought up his guns and opened fire on the enemy, killing and wounding over thirty of them. Afterwards he got his guns into position for the barrage, and gave our attacking infantry valuable assistance. Colin Roy Colquhoun, law clerk, age 19, born at Goodwood, Sth Aust; Enl.26Jul1915 at Keswick, Sth Aust with previous service of 3 years Vol School Cadets, 3 years Senior Cadets and after leaving school transferred to 78th Infantry MGS, still serving; Emb.24Oct1915; TOS 50Bn 26Feb1916 at Tel el Kebir; TOS 13th MG Coy 16Mar1916; to Cpl 03Aug1916; to Sgt 23Aug1916; to Coy Sgt Mjr 06Mar1917; to Officer's Cadet Bn 25Nov1917; Appt'd 2Lieut 01Jun1918; to Lieut 01Sep1918; awarded MC 21Nov1918; RTA 19Jun1919; Appt terminated 29Sep1919; WWII: Enl.20May1940 at Adelaide, Sth Aust at age 39 and a practising barrister; Emb.01Nov1941 with 2/9 Cavalry; areas of service outside Australia include Middle East 01Nov1941 to 27Feb1943 and Borneo 23Apr1945 to 11Oct1945; Disch.24Jan1946 as WOI ex 2/9 Cavalry Regt. Colin Roy Colquhoun MC was educated at Flinders Street Public School and Adelaide High School before studying at Adelaide University when he enlisted in the AIF. Although not recorded on his military file, newspaper reports state that he was severely gassed at Paschendaele in 1918 and after returning to Australia he was unable to resume his studies because of his injury but after a successful operation at Keswick Military Hospital in 1923 he was able to do so. For some time he was clerk in charge of the Master's Office at the Supreme Court and Deputy Registrar of the High Court. In December 1925 he was articled to Mr G.A.Pav solicitor and formerly a Captain in the 48th Battalion. He married Miss Maybelle Fox, a well-known Adelaide elocutionist who also produced and wrote plays, one of which starred Colin Colquhoun. He applied for and was admitted to the Bar at the Supreme Court of South Australia on 15 December 1928. In October 1951 Colin Colquhoun, city solicitor, of Tusmore, an inner east suburb of Adelaide, was the subject of a sea rescue after he set off alone in a 23-ft motor boat from Port Adelaide to go fishing. His engine failed that night and the sea was too deep at his location for the anchor to be effective so the boat drifted. After 3 more nights and days in rough seas and heavy rain he was finally sighted by a RAAF Bristol Freighter from 34 Squadron which was able to guide the interstate passenger ship Duntroon to rescue him near Troubridge Hill Lighthouse at the foot of Yorke Peninsula. Colin Colquhoun died on 23 September 1964 at his residence at Glenelg, South Australia. With copy of Service File, other research and photo of grave.